This little Vietnamese noodle restaurant has been serving simple, tasty Vietnamese noodle dishes to Dalston residents (and anyone willing to travel) for nearly three years; indeed in the time it’s taken me to finally make my way there, founder Colin Tu has launched another Vietnamese restaurant, MAM, in Nottinghill and a second branch of Salvation in Noodles in Finsbury Park. We finally visit after dropping in to the Open Studio day of one of Britain’s foremost ceramic artists, Kate Malone, just a minutes’ walk away. It seems the perfect opportunity to sin in style. SIN (as it’s abbreviated), sits in small, unassuming property and is similarly pared back inside – plain white walls to one side, exposed brick to the other, an MDF floor and simple school-style tables, chairs and stools. For me, it’s more shabby than chic, and could benefit from a little refurb to soften the stark. 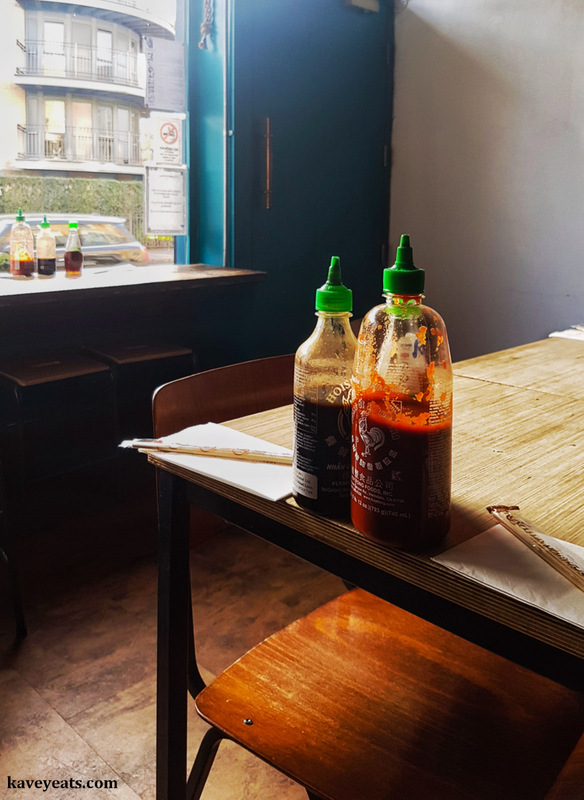 Tables are adorned with sriracha, hoisin and fish sauce. As we visit during the day, the spicy pho dishes are not available, but the rest of the pho menu and the noodle salads certainly are, together with a selection of starters. 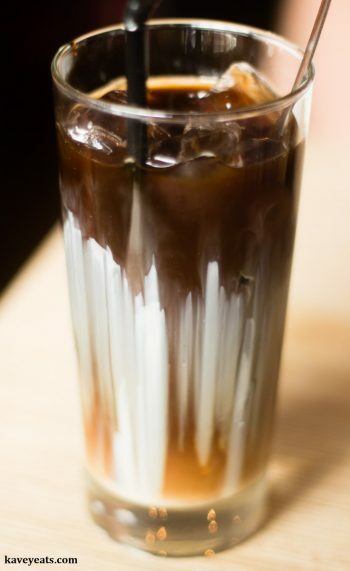 Be aware, if you look at the menu on the website, that the menu here is less extensive than at the newer Finsbury Park branch, as shown online. 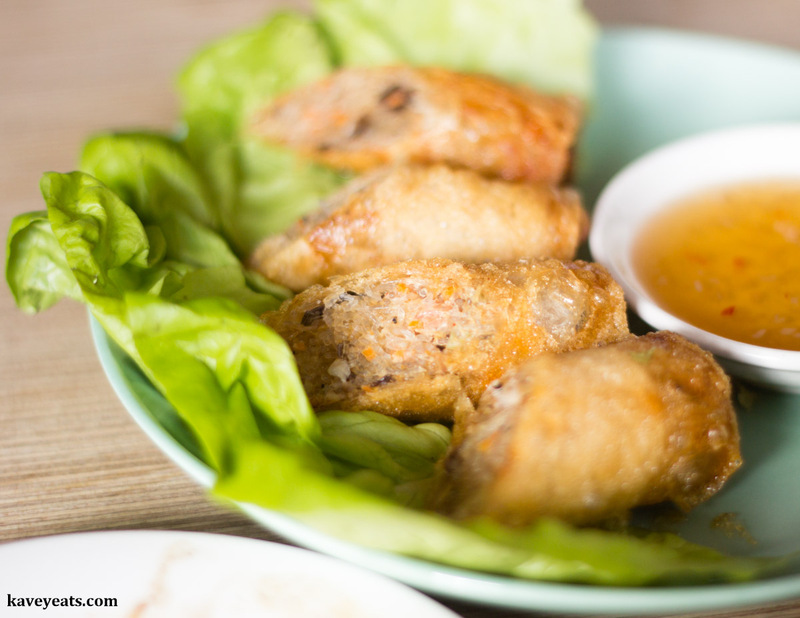 Both the main dishes we want are covered by the lunch menu deal – £9.99 for a main plus one Goi Cuon (summer roll) or Cha Gio (deep fried spring roll). As the restaurant is short one of their usual members of kitchen staff, we’re advised that the summer rolls are not available today so we both have the Cha Gio. Which are tasty and crunchy and a jolly good start. 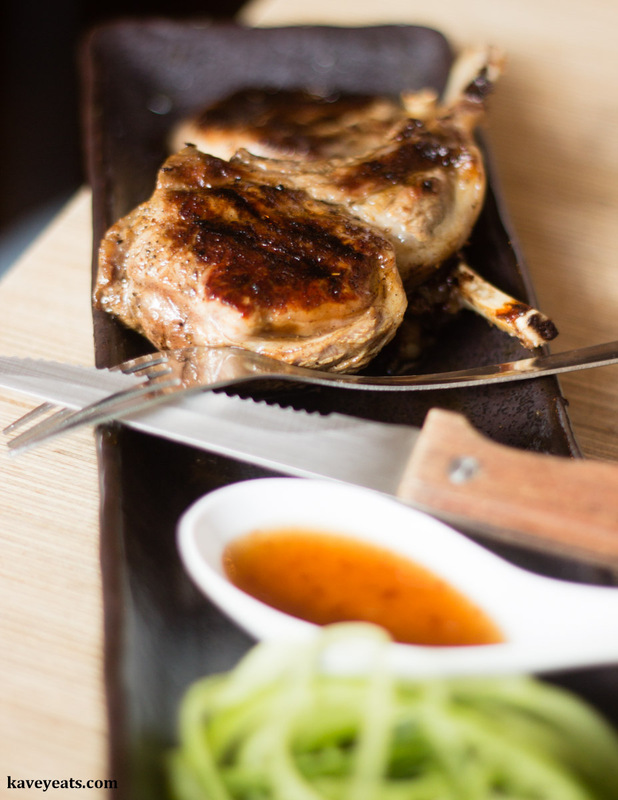 To that, we add a Xa Lamb Chops (£7), marinated in lemongrass and chargrilled, served with cucumber strings and a chilli dipping sauce. The meat has fantastic flavour – more hogget or mutton than lamb, which I like very much – but the meat is a bit tough. Pho bo (beef pho, £9.50 on the regular menu) is a huge bowl of flavoursome broth with a surprisingly generous portion of thinly sliced steak, and a tangle of tasty noodles lurking in the depths. The broth is at the same time meaty, yet citrusy, herby and light. I’ve had more complex pho broths – notably the one I learned to make from my friend Uyen Luu – but the SIN version is pretty good, and certainly better than those of other pho restaurants I’ve visited. The beef is incredibly tender from first bite to last. 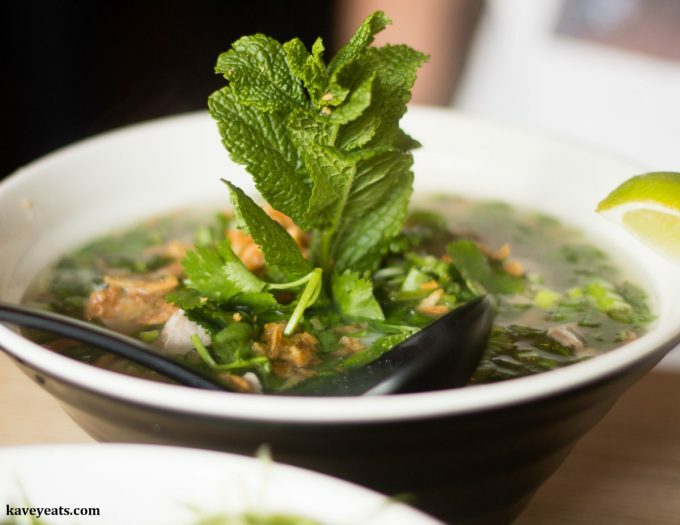 Lifting the flavour profile are generous garnishes of fresh coriander and mint, chilli, lime juice and fried shallots. 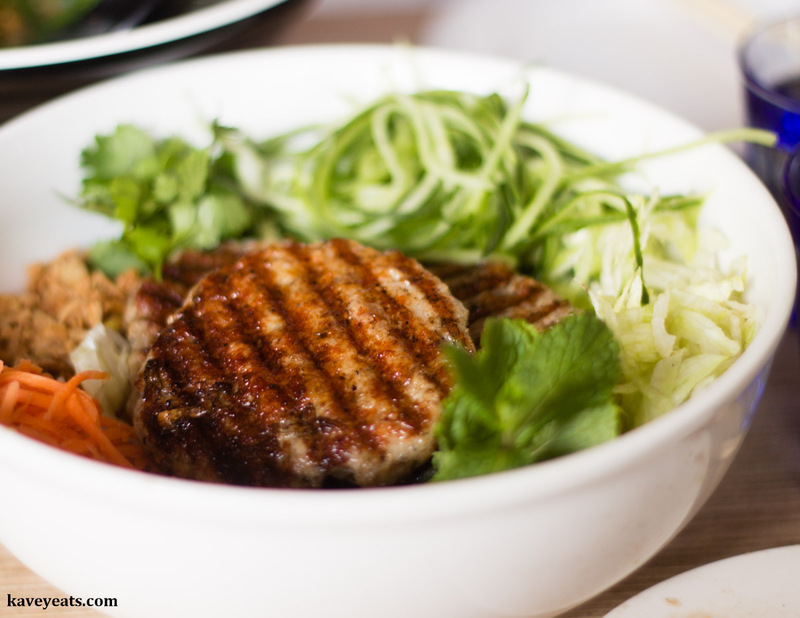 Bun Nem Nuong (rice noodle salad with grilled pork patties, £9.50 on the regular menu) is wonderful. It’s hard to beat the punchiness of flavour in a good nuoc cham dressing, with which the cold rice noodles are drenched. Also in the salad, crunchy lettuce, cucumber strings, fresh mint and coriander, pickled carrots and roasted peanuts and fried shallots. On top of this are three generously sized pork patties, hot, juicy, and delicious. For me, the space itself makes this unlikely to be a place I’d linger and that’s in keeping with the self styling as a ‘noodle shack’, a semi-fast-food joint serving a sweet and short menu of delicious food to hungry locals – come in, sit down, order, slurp, sigh with pleasure, pay and head on out! 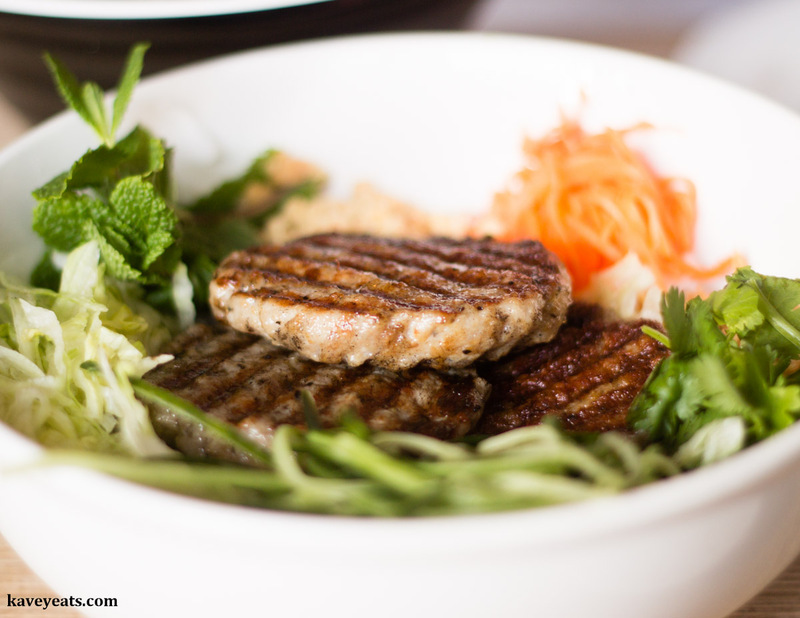 One Comment to "Salvation In Noodles | Sinful Vietnamese Noodle Shack in Dalston, London"
That bun nem nuong looks delicious.